UpaDowna.com Gets A Face Lift! When the alarm goes off around 5:00am the dog stretches, opens one eye quizzically, then rolls over. I want to do the same, but the predicted temperture is close to mid nineties. I have some miles to do and I prefer not to bake myself in the process. It has all been coming back to me, Colorado running in the heat, bring water and gu for the long runs, and more water, oh, and water for the dog. Hike, Drink Beer & Help Cheyenne Cañon!! Due to a very hectic training and racing schedule my blog entry for this week will be to wish everyone the best of luck with their training, tapering, and racing endeavors. May you hit your goals and compete injury free. Ask the Coach - Swim, Bike, or Run? Just updated my linx page at rollbikeart.com... Check it out, we have so many great local organizations, businesses and artists all just a click away! My time at the Garden of the Gods 10 Mile was 1:20:31. That was way faster than my goal and I surprised myself. My splits were pretty close (except mile 7-8) which tanked by about 20 seconds. I even got there before the thing started - which was my main concern! I took some video along the way but the only one that is even watchable is this one of the start. The others are basically just of my fingers (ha!). I tried. Its taken me a bit of time to process Sunday. 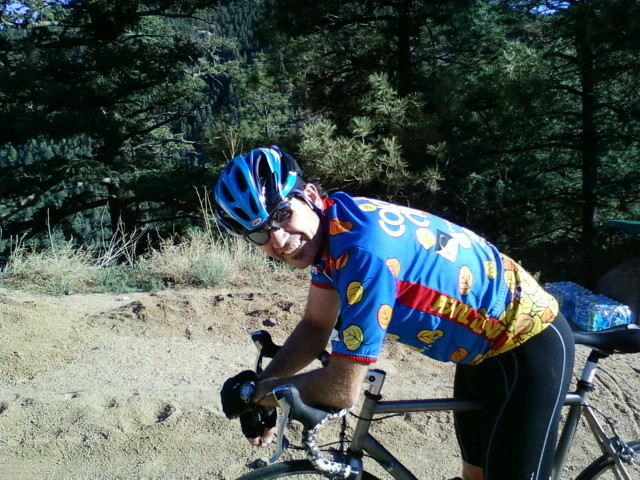 Woke up, did all the usual pre-race stuff, and rolled into Manitou. Greeted by incredibly positive and supportive team members (thanks!). Local Pros Gonzales, Macgraw headline "Lucky #7"
Southern Colorado is home to ROLL Bike Art Festival and a vibrant bicycle community. Two of the most notable cycling enthusiasts in the region are Professional Artist David Gonzales and Pro Flatland BMXer James Macgraw. ROLL is the place to be as these local pros strut their stuff at the 7th Annual Bike Festival, ROLL 2011.